Crochet this lovable little elephant to attach to a blanket, bag, hat, jacket, or anything that you can think of! The elephant is crocheted seamlessly in the round from the center out. Then the heart shaped ear is sewn on. The applique works up very quick so feel free to make a bunch in different colors. Round 4: (2 sc in next sc, sc in next 2 sc) 3 times, (hdc, 3 dc) in next hdc, dc in next hdc, hdc in next hdc, ch 7, sc in second ch from hook, 2 sc in next ch, (sc in next ch, 2 sc in next ch) 2 times, sc in next hdc, (hdc, dc) in next hdc, dc in next hdc, (dc, ch 2, sl st) in next hdc, sl st in next hdc, (sl st, ch 2, dc) in next hdc, dc in next hdc, (hdc, sc) in next hdc, sc in next hdc, sl st in first sc, ch 5, finish off. With a yarn needle and black yarn, embroider eye to elephant. Finish off, leaving a long end for sewing. With a yarn needle, sew ear/heart to elephant using photo as a guide. 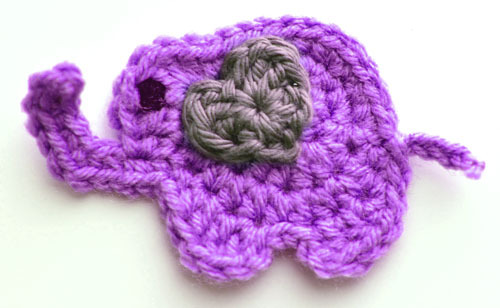 Need help while crocheting your elephant? Leave your questions below! This entry was posted on Monday, March 19th, 2018 at 12:00 AM by Rachel Choi	and is filed under Free Crochet Patterns. You can follow any responses to this entry through the RSS 2.0 feed. You can skip to the end and leave a response. Pinging is currently not allowed. A very efficient way to make a small and lovely elephant. Thanks. I love how the ear is a heart. Very cute. Thanks for sharing.